If you enjoyed the Risotto, hold onto your hats folks. These risotto balls are arguably even better than that. I kid you not, these were some of the best things I have ever eaten. Really, how can you go wrong with taking one of the most delicious dishes on earth and deep frying it, it's impossible. The idea for these came from a deep fried macaroni and cheese that my boyfriend and I fell in love with at a restaurant a while back. I thought I was going to hate it. I really wanted to hate it. It just sounded like to much bodily harm. But it was good, so good that I still think of it on a fairly regular basis. I refuse to allow myself to make it a home though, because I'm afraid I'll never stop. I rationalized however that risotto didn't have quite as much cheese and other artery clogging ingredients so it was okay. Don't laugh. 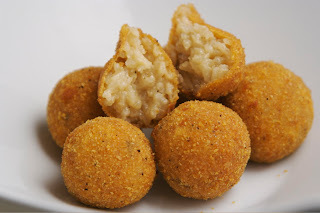 While the idea came from deep fried macaroni, upon further investigation I found out there were recipes abound with these risotto balls, otherwise known as Arancini. Although traditional Arancini have mozzarella placed in the center. Huh, who knew? Only all of Italy, that's who. So if you need some rationalizing of your own, just tell yourself the Italians have been doing it for years. And you should never, ever argue with an Italian. Preheat your oil to 350 degrees. Spoon a couple of tablespoons of cold Risotto into your hands and roll into a ball, about 2" thick. Roll the ball in flour. followed by egg and then rolled in breadcrumbs. Continue with the rest of the risotto. Carefully place the risotto balls into the oil and fry for 2-3 minutes on each side, until golden brown. You may have to do this in batches. Remove the balls and drain on a rack or paper towels. They look fantastic, and I totally agree. Admittedly, I've not deep fried any risotto lately. But, one look at this and I'm sorely tempted. Now, if only we had leftovers when we make risotto!! Arancini is a great reason to make extra risotto! I like the sound of that deep fried macaroni and cheese as well! Hi Lo, I know, it's hard to have leftover risotto sitting around. That's why I always make, extra, extra! Sure is Kevin, but trust me, that deep fried mac and cheese is dangerous!! Mmmm, I agree. Risotto balls are even better than risotto! These bring back memories--a friend's Italian mom used to make these (without a filling) and it was all I could do to politely restrain myself from inhaling the entire plate. She mixed grated romano cheese in with the risotto but not sure how much. Thanks for this! Mmmm Anon, Romano sounds great!